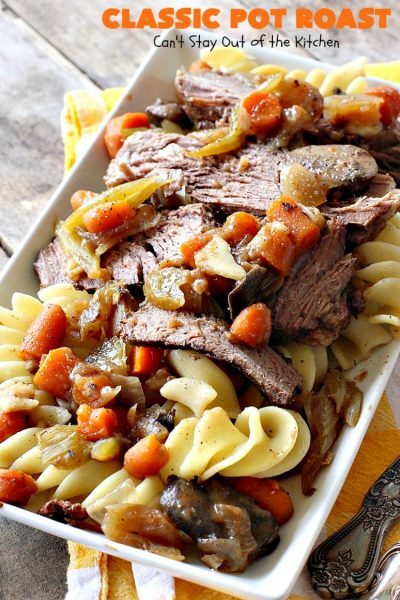 Classic Pot Roast is absolutely mouthwatering. 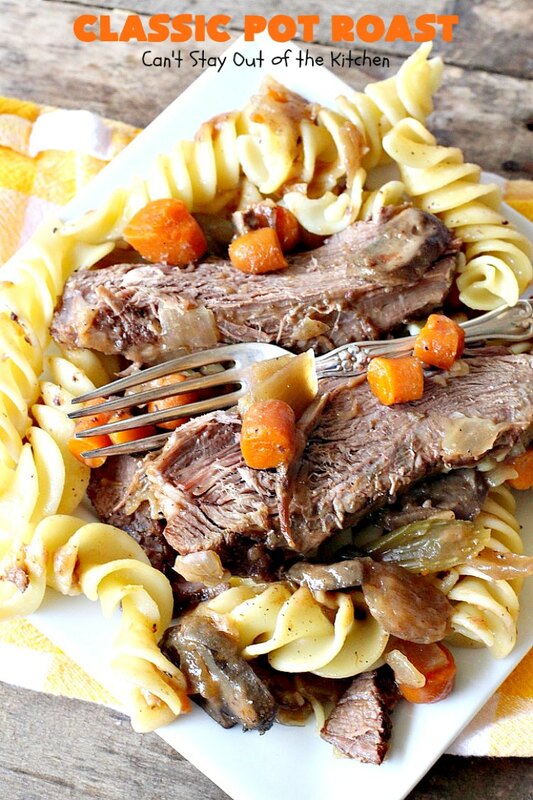 I love a good pot roast recipe, and I have several of them on this blog. I have a gluten free recipe, an easy 3-packet recipe and one for the slow cooker. Plus, of course, Mom’s recipe. All are delicious, but this Classic Pot Roast recipe is different. Instead of potatoes, it calls for pasta! I love it. Several months ago an elderly lady gave John several cookbooks for me. Anyone who knows me, knows I love a new (and good) recipe. And, since I’m an old fogey, I still enjoy looking through old or classic cookbooks. Especially ones with pictures to drool over. One of those cookbooks was an old Family Circle cookbook. Yes, it had pictures. Yes, it had some great looking recipes for me to try out, including this one. 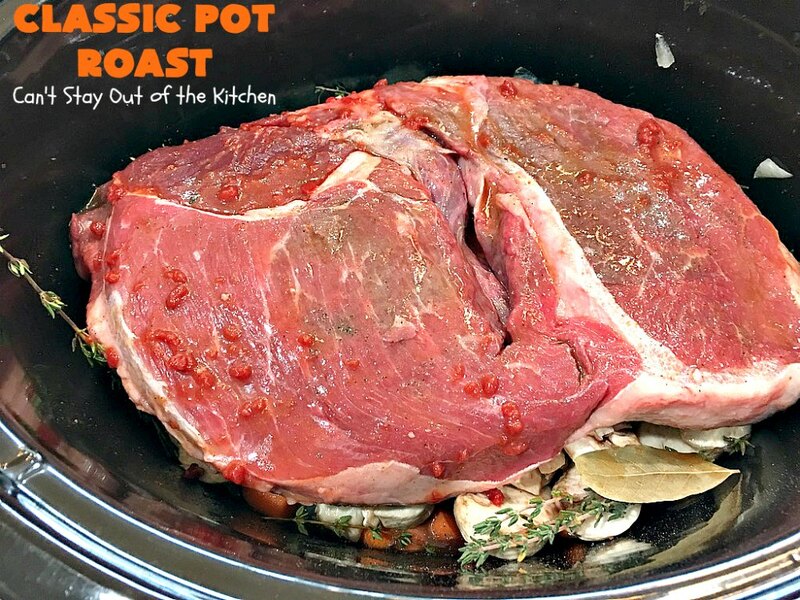 I loved how this entree could be tossed in the crockpot. That made everything a lot easier for me since I was doing a lot that day. 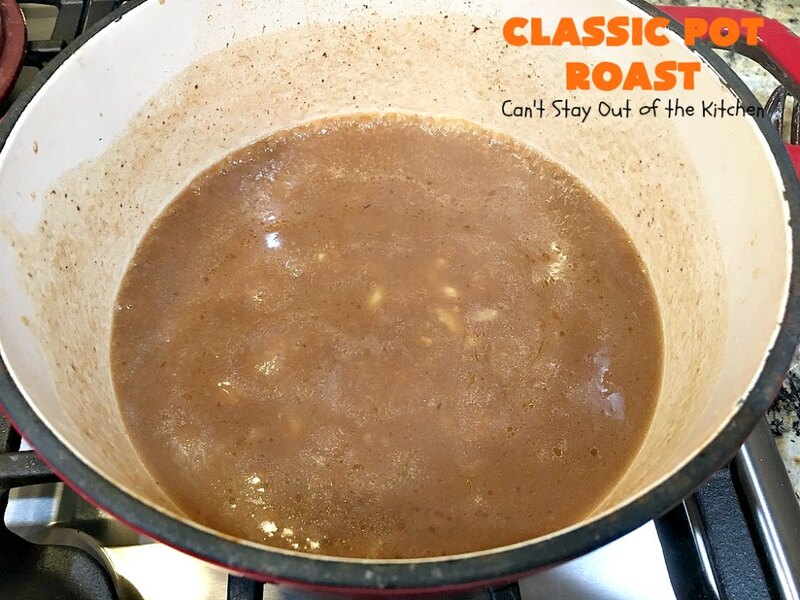 After the roast cooks, you make up gravy from the broth in the slow cooker. Then you cook up the pasta of your choice. 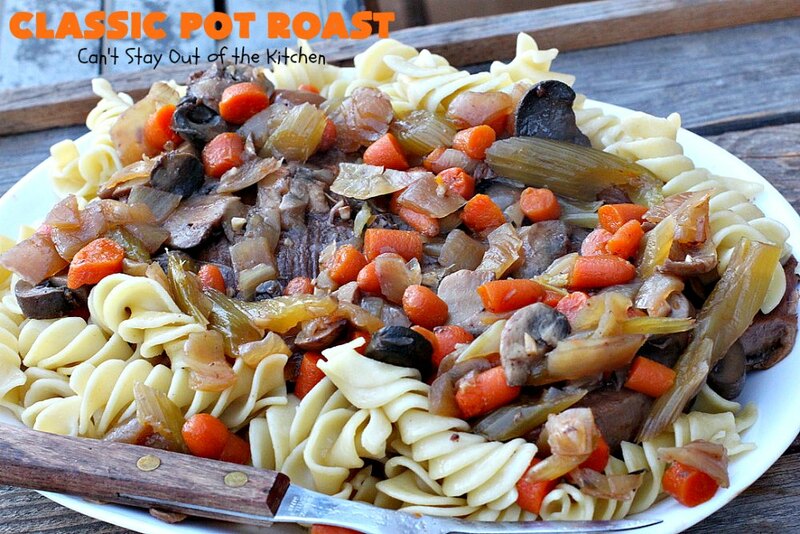 The roast is served with celery, onions, carrots, mushrooms, gravy and pasta. It’s truly a marvelous recipe and one we really enjoyed. 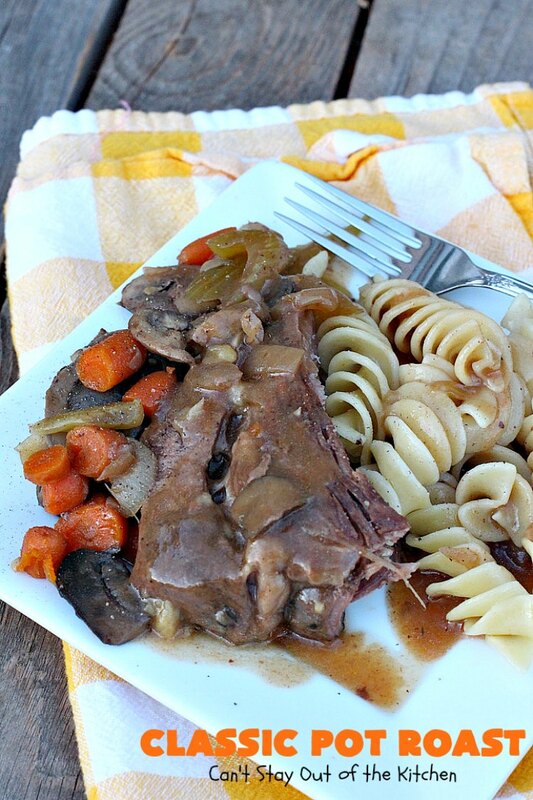 If you want an almost effortless, but fantastic main dish meal this Classic Pot Roast is it. It’s especially comforting for dreary and drab winter days when you want to be warmed up by something special. I guarantee you’ll be salivating like Pavlov’s dogs after one succulent bite of this amazing dinner. Hey, go grab me a fork! 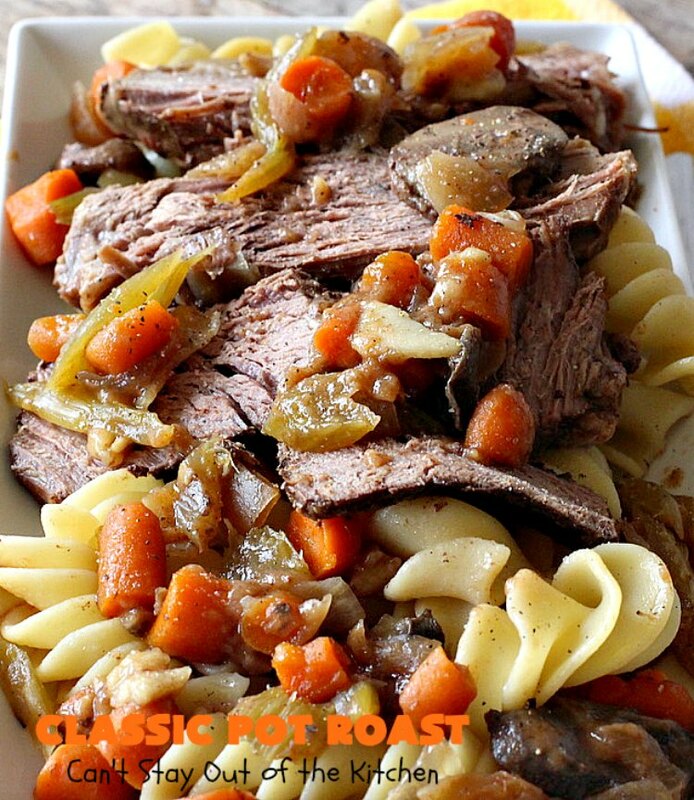 Classic Pot Roast is so mouthwatering. We loved the way this recipe turned out. It’s savory and succulent. 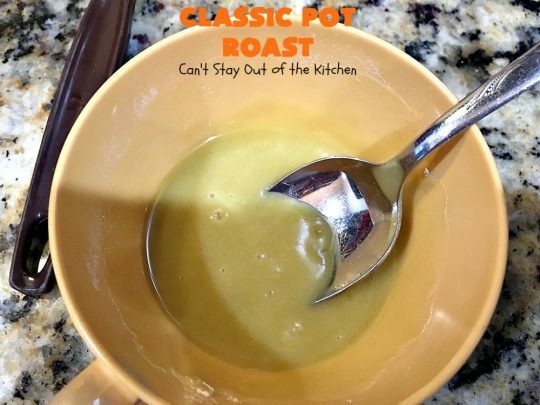 Rub olive oil over top and bottom of roast. 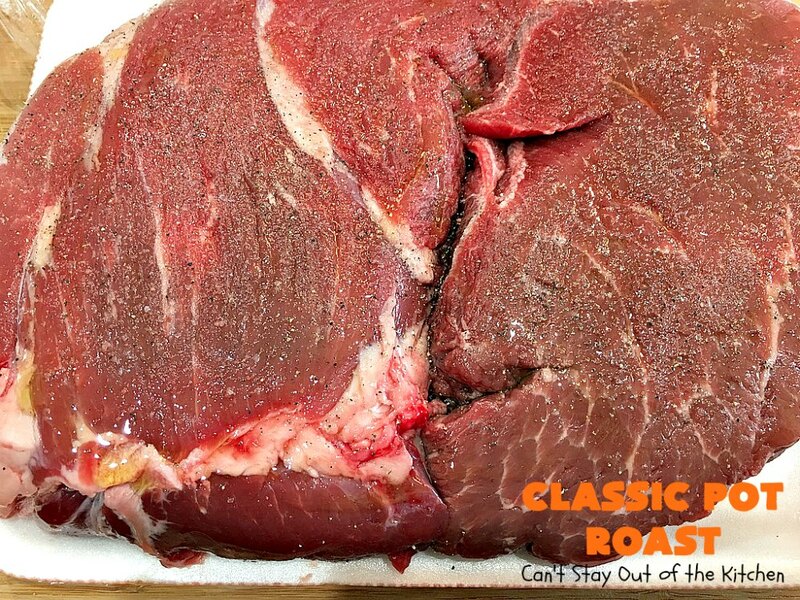 Season roast with salt and pepper on both sides. Set aside. Place onions, garlic and celery in a large crockpot. Add mushrooms and carrots. Then place beef roast over top. Tuck in the fresh thyme and bay leaves under the roast. Combine beef broth and tomato paste. Pour broth mixture over top of roast. Cover with lid and cook on high heat about 4-6 hours. Remove lid. Set beef and vegetables on plate. 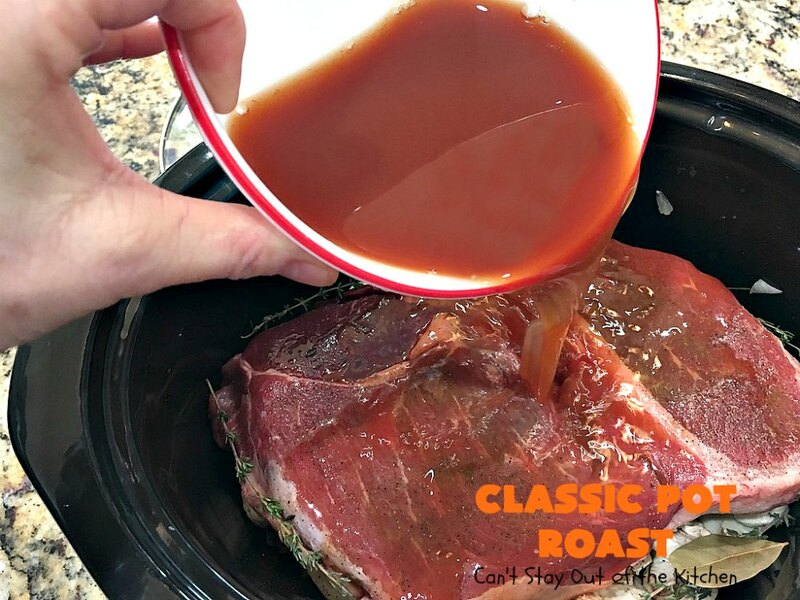 Pour broth from slow cooker into a medium sized sauce pan and cook over medium heat. Combine flour with olive oil. Slowly add flour mixture into gravy and cook until mixture thickens, whisking continuously. To serve: place cooked pasta on a large platter. Add beef roast. Top with veggies and gravy, as desired. 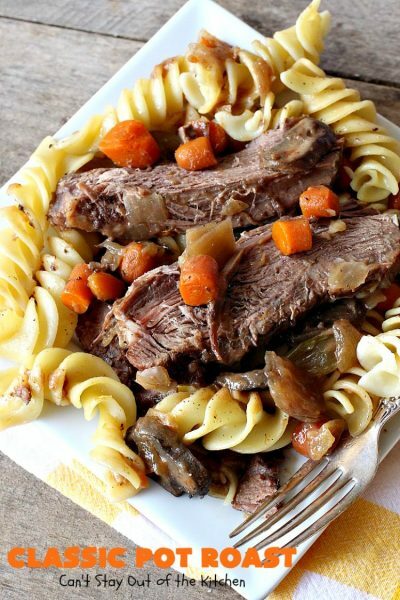 Classic Pot Roast is wonderful comfort food during cold, winter months when it’s dreary and drab outside. Eating Pot Roast with pasta instead of potatoes is a real treat. 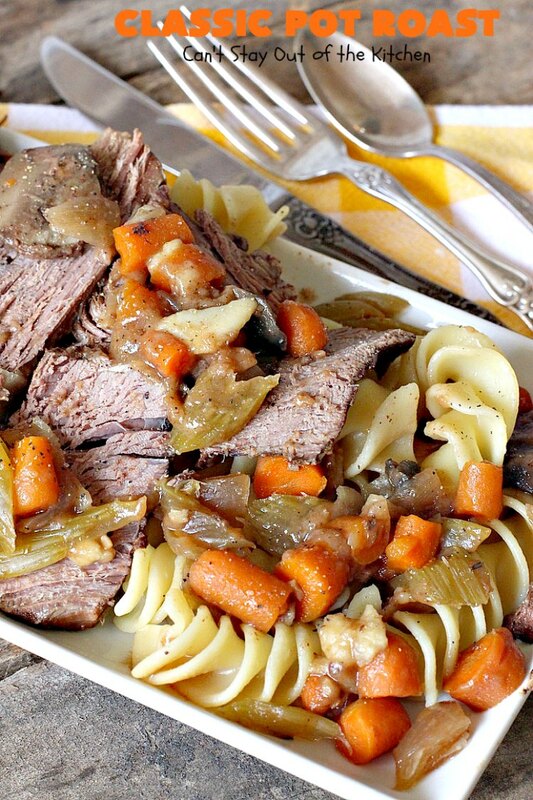 If you enjoy beef for dinner, you’ll love this Classic Pot Roast recipe. Classic Pot Roast is perfect for dreary and drab winter nights when you want to warm up with something delicious! 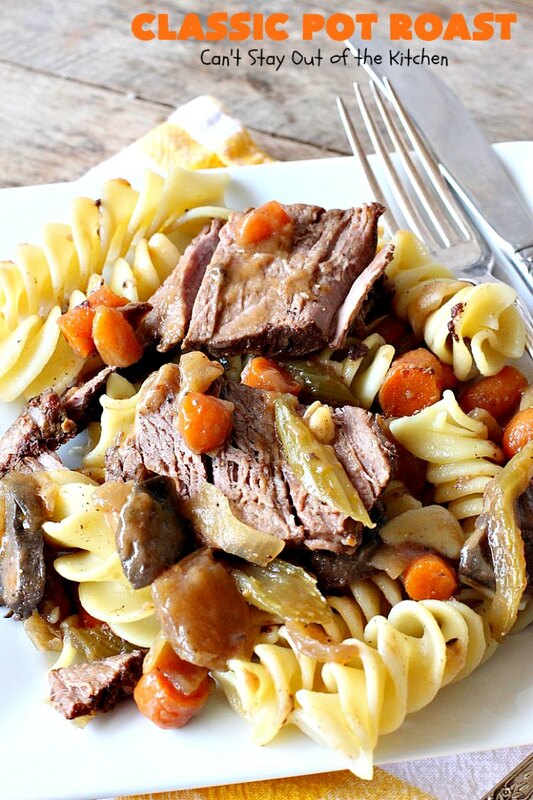 This entree includes beef roast, carrots, celery, mushrooms and onions in gravy and served over cooked pasta. Amazing comfort food recipe that's hearty, filling and totally satisfying. 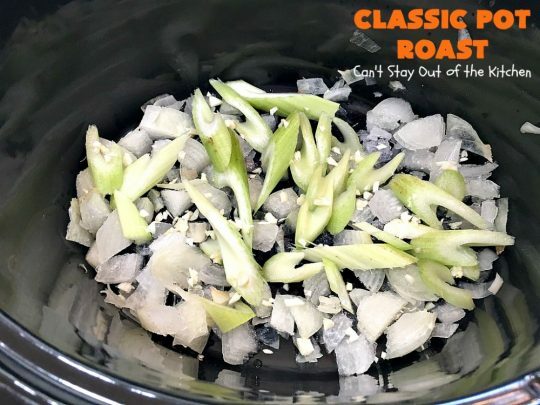 Layer onion, carrots, celery and garlic in a large slow cooker. 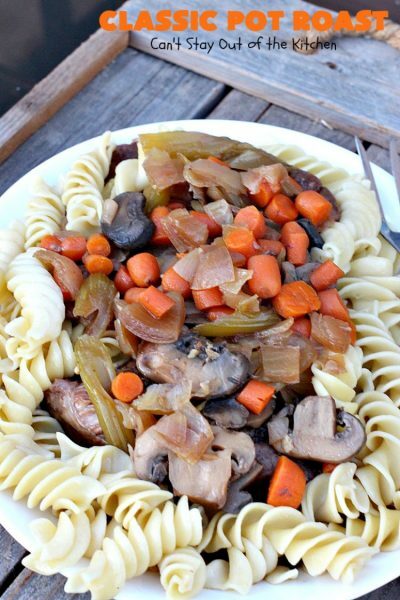 Scatter mushrooms over top of veggies in crock pot. 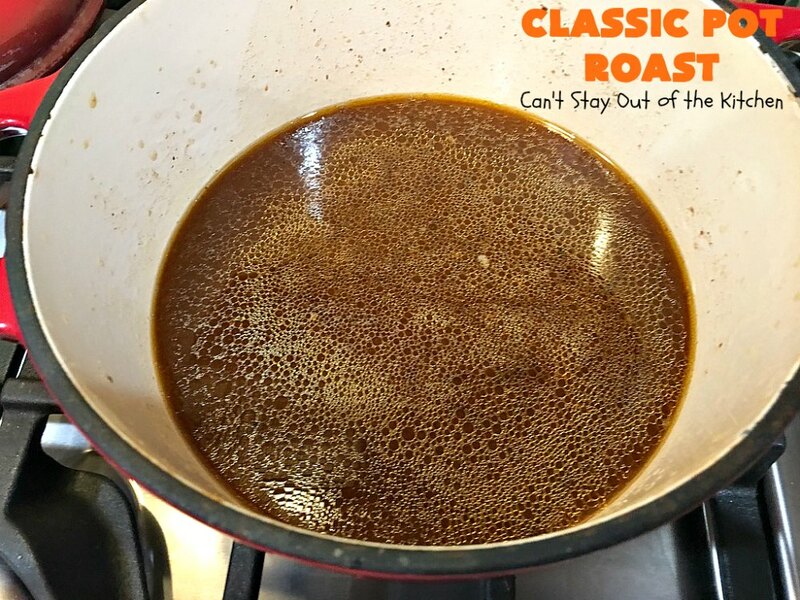 Rub one teaspoon olive oil all over the roast. Place roast on top of mushrooms and other veggies. Tuck sprigs of thyme and bay leaf around roast. In a small bowl, combine beef broth and tomato paste. Pour mixture over top of roast. 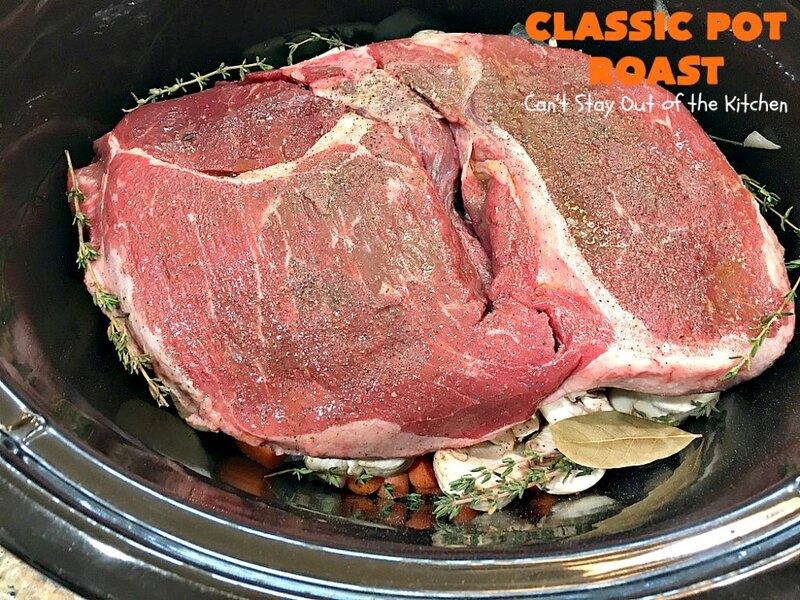 Cover slow cooker; cook on high setting for about 4-6 hours. 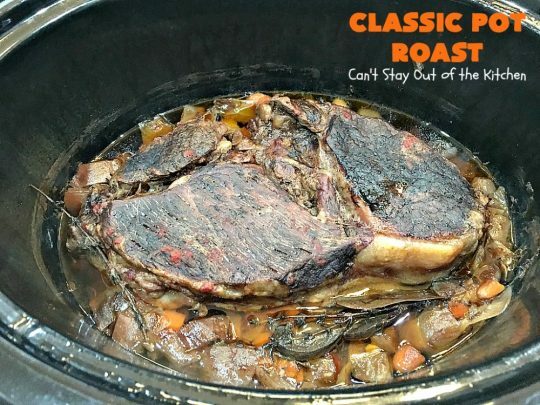 Remove roast from slow cooker and keep warm. 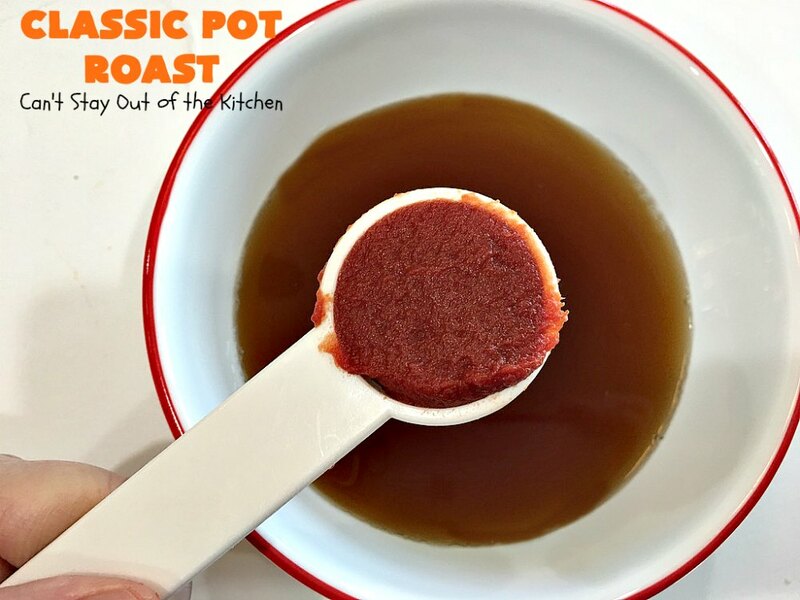 Pour liquid with vegetable mixture from the slow cooker into a medium-sized saucepan. Remove and discard thyme sprigs and bay leaf. Combine two tablespoons olive oil and flour in a small bowl. Stir flour mixture slowly into liquid in saucepan. Boil, stirring constantly until mixture thickens – about one minute. Drain noodles well and toss with additional olive oil so the noodles don’t stick. Serve with veggies, gravy and cooked egg noodles. Recipe adapted from Family Circle Cookbook, "Our Best Recipes," circa 2007. If you want a comfort food meal, this is it. Pot roast with carrots, mushrooms, celery, onions, gravy and pasta is really delicious. Once you try Classic Pot Roast, you won’t want to go back to eating it any other way! wow it looks so great teresa! 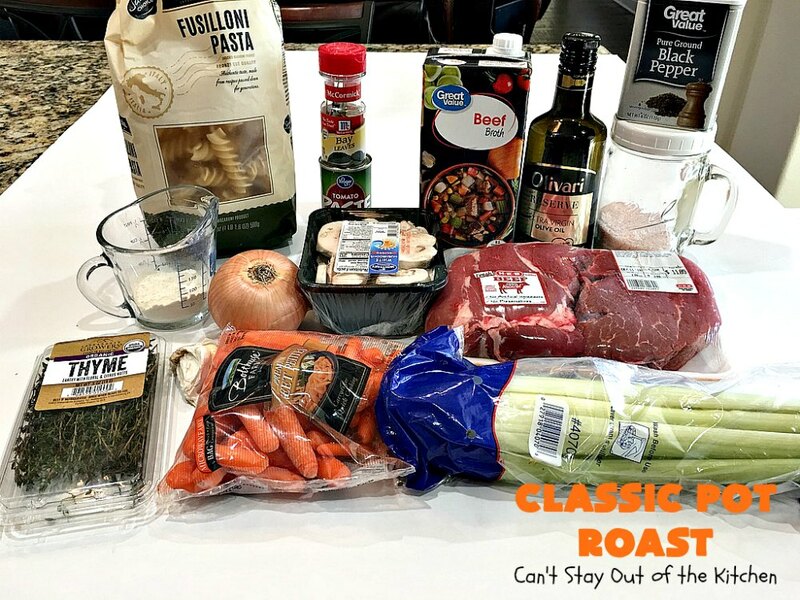 i wonder that i can make this pot roast using chicken what do you recommend ? hi Mary. I think you could. I would substitute chicken broth for beef broth and bake in a roaster oven. I would probably spread olive oil over the whole chicken and then sprinkle with a dry rub or some favorite herbs like thyme, parsley, oregano and rosemary. (Rather than browning in oil first, like you do for a pot roast). Other than that, I think all the other veggies and noodles would go great for this recipe.